The Future of Semiconductor Oxides in Next-Generation Solar Cells begins with several chapters covering the synthesis of semiconductor oxides for NGSCs. Part II goes on to cover the types and applications of NGSCs currently under development, while Part III brings the two together, covering specific processing techniques for NGSC construction. Finally, Part IV discusses the stability of SO solar cells compared to organic solar cells, and the possibilities offered by hybrid technologies. 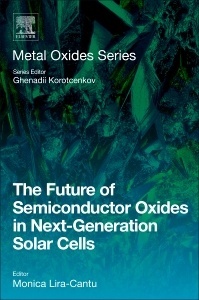 This comprehensive book is an essential reference for all those academics and professionals who require thorough knowledge of recent and future developments in the role of semiconductor oxides in next generation solar cells. Monica Lira-Cantu is Group Leader of the Nanostructured Materials for Photovoltaic Energy Group at the Catalan Institute of Nanoscience and Nanotechnology (ICN2), CSIC and the Barcelona Institute of Science and Technology (BIST) in Barcelona (ES). She is also visiting professor at the Laboratory of Photomolecular Science (LSPM) at the École polytechnique fédérale de Lausanne (EPFL, CH). Prof. Lira-Cantu has directed several national, international and industrial projects, and is currently the coordinator of the European StableNextSol COST Action related to the stability of emerging solar cells.